Tigers manager and catcher Mickey Cochrane named Elden Auker, the “big submarine hurler,”3 as his Opening Day starter. Cleveland skipper Steve O’Neill, in his third season leading the Tribe, countered with Mel Harder, a 6-foot-1 right-hander. Action started right away. The Indians’ Lyn Lary led off the game with a double to right. Roy Hughes followed with a bunt single to the left of the batter’s box. Auker retired Earl Averill on a pop fly to third baseman Rudy York. With Hal Trosky batting and runners at the corners, Hughes broke for second as Trosky struck out. Cochrane threw directly to shortstop Billy Rogell, who fired right back as Lary raced toward the plate. Cochrane, “in characteristic fashion, lunged for the Cleveland shortstop and turned a complete somersault while tagging him out”4 for a 2-6-2 double play. In their half of the first, the Tigers also got things going right away. Jo-Jo White doubled down the left-field line and Cochrane sacrificed him to third. Charlie Gehringer worked a full count and then drove a single to right center to knock in White with the game’s first run. In the top of the second, Moose Solters walked and an out later Bruce Campbell forced Solters at second. Auker hit Frankie Pytlak with a pitch, and pitcher Harder’s two-out single into right field brought Campbell around to score. In the bottom half, in his first at-bat of the season, Walker launched a home run over the left-field wall to lead off the inning, once again giving Detroit the lead. The Tigers’ lead did not last, as the Indians got three more hits off Auker in the top of the third. With Hughes on first after a single, “Averill whistled a drive down to first baseman Hank Greenberg,”5 who threw out Hughes at second, but Averill beat the relay to first. He advanced to second when Auker walked Trosky. Odell Hale then drove in Averill with a single to center to knot the score at 2-2. Leading off the bottom of the fourth inning, Walker tripled to center. Harder then walked Goose Goslin on four pitches.7 With rookie York at the plate, Harder “uncorked a pitch that catcher Pytlak couldn’t hold,”8 allowing Walker to race home and Goslin to scamper to second. York’s grounder to shortstop moved Goslin to third. Rogell grounded to second baseman Hale, who fired home for the out, but Goslin slid safely under the catcher and jarred the ball loose. The two unearned runs made the score 4-3 in favor of the hometown Tigers. That was all the scoring; the fans could probably tell that both teams were a bit rusty, with all the walks and errors. In the home half of the fifth, Greenberg drew a one-out walk and Walker doubled to start another rally, but the Tigers could not score. In the seventh, Walker singled to left to complete the cycle. He was forced out at second by Goslin’s grounder to the pitcher. In four trips to the plate, Walker had scored two runs and driven in one (on his solo homer). Auker was touched for seven hits in the first four innings and, according to the Detroit Free Press, “was in all sorts of trouble. But when his mates rallied and gave him the lead again in that eventful fourth, Elden pitched like he never had before. He allowed only two scratch hits over the rest of the way and protected that slim one-run margin with a bitter determination.”9 That included getting out of a jam in the eighth inning when Cleveland loaded the bases10 with two outs, but Auker was able to get Averill on a groundout to second. When he struck out Hale, looking, to end the game, Auker had his first win of the season. He had to wait more than a month, until May 28, for win number two. After two more starts, both losses, his ERA ballooned to 10.22, and Auker was sent to the bullpen after a May 9 start until Cochrane started him again on May 28. The Tigers won nine of their first 13 games, but on May 10, they lost to Philadelphia and never saw first place for the rest of the season. The Indians were tied with Detroit on May 9 for the top American League spot, but by May 11, they too dropped from first and failed to reclaim the lead,11 owning fourth place when the 1937 season ended.12 Cleveland’s bright spot of the game had to be seeing Lary and Hughes collect three hits each. Even though Harder took the loss, he allowed only two earned runs in seven innings pitched. Of the eight hits he allowed, half were for extra bases, and three of those went to Walker. Walker, who had batted .353 in 1936, collected his first four hits of the season and the quartet just happened to accomplish the rare feat of hitting for the cycle. He became the first player to hit for the cycle on Opening Day. Baby Doll Jacobson of the St. Louis Browns hit for the cycle on April 17, 1924, an earlier calendar date, but it was the Browns’ third game of the season. Thirty-five years after Walker, on April 16, 1972, San Francisco’s Dave Kingman used his first four hits of the season to hit for the cycle, but it was his second game of the season. Two other players, both Yankees, hit for the cycle in 1937. Joe DiMaggio accomplished the feat on July 9 against the Washington Senators, and Lou Gehrig on August 1 against the St. Louis Browns. At the end of this historic first game of the 1937 campaign, Walker was batting 1.000. He had an on-base percentage of 1.000 and a slugging percentage of 2.500, making his OPS 3.500. He batted .335 for the season, drove in a career-high 113 runs, and made his only All-Star team in a 15-year career in both leagues, but had only four triples. However, one of them contributed to this notable cycle. In addition to the sources mentioned in the Notes, the author consulted Baseball-Reference.com, Retrosheet.org, and sabr.org. 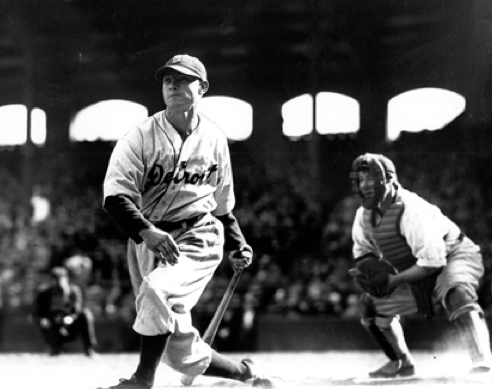 1 W.W. Edgar, “38,200 See Tigers Beat Indians, 4-3, in Season Opener,” Detroit Free Press, April 21, 1937: 1, 19, 22. 7 “‘Gee’ Walker,” The Tennessean (Nashville), April 21, 1937: 15. 10 The baserunners came by way of a walk, an error, and a bunt single. 11 The Indians managed a tie for first place as late as May 21. 12 Cleveland manager Steve O’Neill was replaced by Ossie Vitt after the end of the season and in 1943 landed a job managing the Tigers. From 1936 to 1938, Mickey Cochrane split managing duties with Del Baker (and Cy Perkins in 1938, too). 13 “Al Simmons, Gee Walker Pace Hitters,” Wisconsin State Journal (Madison), April 21, 1937: 14. 14 After Joe DiMaggio hit for the cycle on July 9, 1937, the Vineland (New Jersey) Daily Journal wrote, “Joe DiMaggio collected a ‘grand slam,’ or every type of base hit” in describing his accomplishment. “Yankees’ Slugger In Rare Feat.” Daily Journal, July 10, 1937: 8.